I mentioned earlier that my experience of having a special “in” with Roy did not result in special treatment in Roy’s hockey program. Likewise Rick and Randy were treated no differently than their teammates. In their Dad’s spirit of fairness, his sons had to earn your spurs like everyone else – maybe more so. Rick went on to distinguish himself as an elite athlete playing for four years at the U of A under the legendary coach, Clare Drake, winning the CIAU title in the 1974-75 season. Before hanging up his skates he played in France with a team, the GAP, winning the Division 1 National Championship two years in a row. 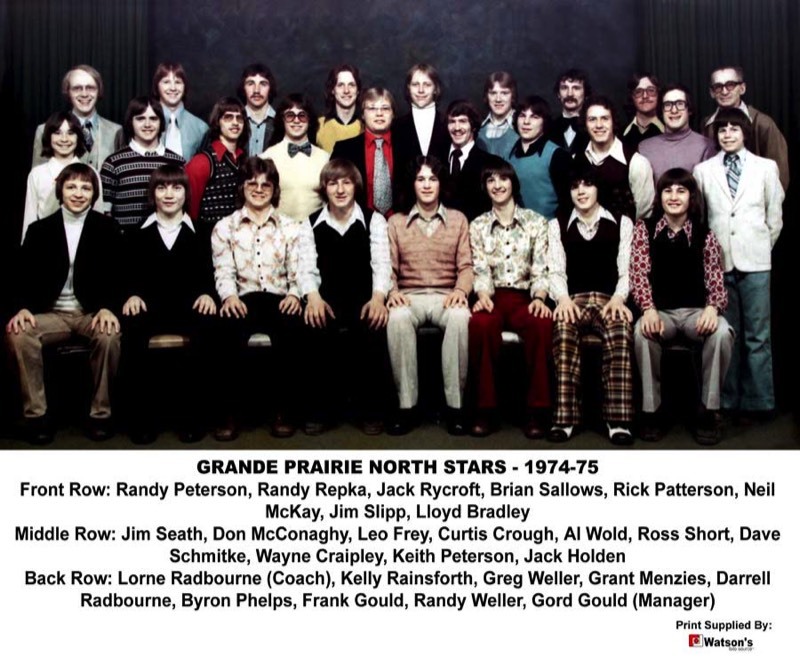 Randy played minor hockey in GP, 3 years with the North Stars, then went to play hockey in Germany. He came back and played two or three seasons with the A’s. Due to our mutual interest Roy in the Legends project, the information I have regarding Roy revolves principally around hockey. However, my recent contact with sons Rick and Randy has exposed a further dimension of the Peterson’s athletic credentials. Rick says, “Although Dad is known for his hockey background, it’s really baseball that he loved. He was a speedy second baseman who hit the ball well.” In his youth he played for the Winnipeg Goldeyes and switched to fast-ball when he moved to Grande Prairie. As in hockey he played, coached and officiated in both baseball and fastball. In 1965 Roy was appointed Commissioner of the Inland Ladies Fastball League. He encouraged his boys to play ball and in 1965 the peewee team he coached captured the city championship. Both Rick and Randy played on that team. Later Rick played for the GP Eskimos, and was on the Sexsmith Rainiers when they won the Wheat Belt League. In the off-season while playing hockey in Europe, Rick played on the Canadian Men’s Senior Championship Team in 1978 and in a tournament that year was voted Top Infielder. Rick commented that his Dad was more excited about his exploits in baseball than hockey. In his playing days, Roy cobbled together ball players from a number of teams and fittingly called them the Combines. Years later, Randy reunited a number of his old baseball buddies to play on an old-timer tournament team and borrowing from his Dad’s baseball history named them the Combines. In a recent e-mail to Stan, Randy proudly announced, “I am manager and sponsor of the Grande Prairie Combines. We are all over 50, we play two tournaments a year: one in Las Vegas and one in Phoenix. We have a sparkling record over the years of 4 wins and 21 losses.” Fortunately for Randy and his clients, I am told this is not mirrored in his record as a businessman. Roy delighted in Randy’s Combines following their fortunes as if they were major leaguers. As for the majors – Randy reports that Roy was the Toronto Blue Jays most ardent fan. As much as Roy loved baseball, he will be remembered primarily for his hockey history. He coached for 33 years, officiated games as needed and provided leadership in various administrative roles building solid infrastructure for minor hockey. Along with administrative assignments and coaching duties, Roy was a credentialed referee and he kept fit by shoveling a lot of snow – he did whatever was needed. In 1960 Roy was honoured as Sportsman of the Year. 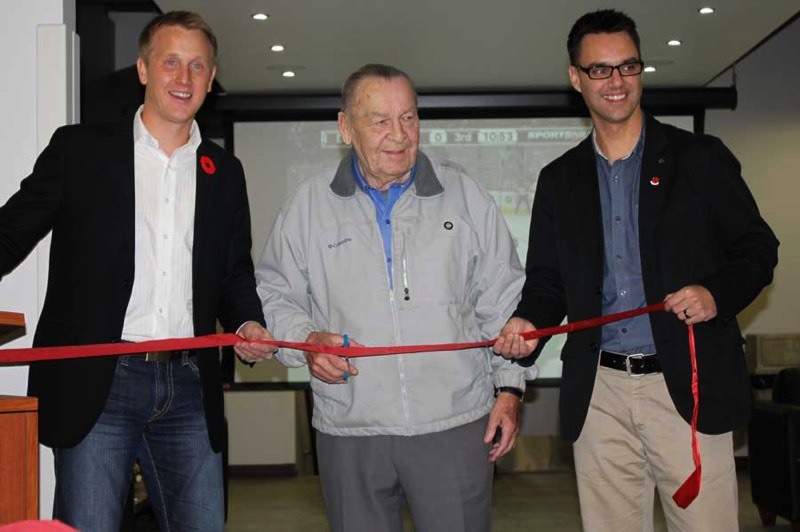 On November 8, 2011 representatives from the City of Grande Prairie in partnership with the GP Hockey Legends cut ribbons that opened doors to the Hockey Legends Lounge in the Coca-Cola Centre. Roy, along with MP Chris Warkentin and Mayor Bill Given were involved in that ceremony. In April of 2013 the Grande Prairie Athletic association kicked off its 10th Anniversary by announcing that the Midget AAA Fall Camp Blue/White game would be known as the Roy Peterson Game. Most recently, our city has named a park after him. Roy would be humbled but surely swell with pride to hear it said that he is regarded as the cornerstone of Grande Prairie Minor Hockey. 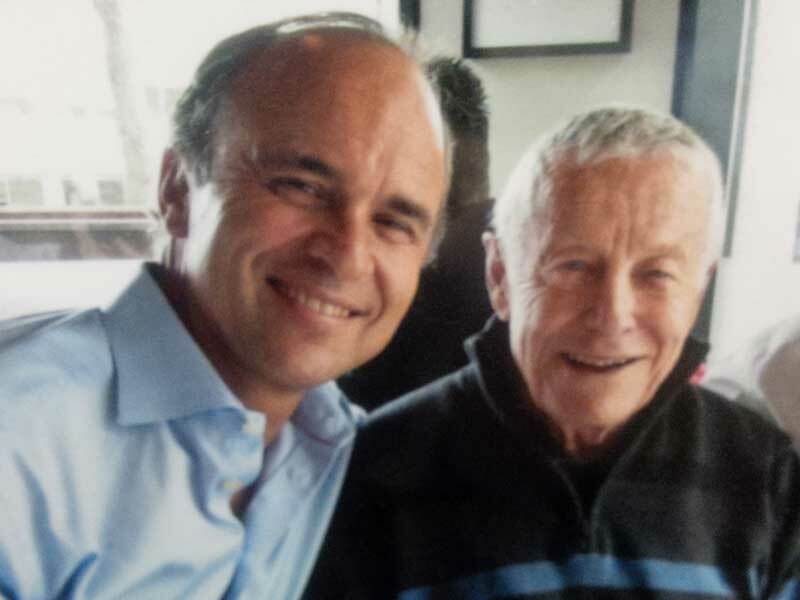 It was from this foundation that he was able to exert a powerful, positive influence on hundreds of young people. He was modest to a fault, always deflecting praise and giving credit to others. That was the nature of the man. I was privileged to know him as a model and as a friend. Furthermore, in the context of his moving on I have had the pleasure of meeting his most enduring legacy – Rick and Randy. If a kid gets used to staying out of trouble in his youth - chances are good that he won’t get in to trouble later. Give everyone who wants to play a chance to play. If a youngster does not have skates or equipment, dig it up for him. Roy – you have served your world with distinction!